Even if you use a great skincare routine that includes the most important products like cleanser, toner, exfoliant, daytime moisturizer with SPF, and a nighttime moisturizer, skin can require more to address specific concerns. Because of our dedication to give you effective skincare you can customize to your exact needs, we’ve created several specialized products with concentrated ingredients. These products allow you to hone in on specific concerns (like large pores, uneven skin tone, and dehydration) and solve the problem, often sooner than you might think (we love that part)! 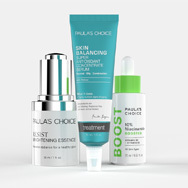 Those products include our boosters, serums, and essence. What Are the Differences Between Boosters, Serums, & Essences? At first blush, the differences between our Boosters, Serums, and Essence might seem subtle, but closer examination reveals the nuances are incredibly important for certain skin types and concerns. Keep in mind that other skincare companies may interpret or formulate their "boosters", "serums", and "essences" differently than we do. Product categories within the cosmetic industry are rarely universal. Because of this, we don’t recommend using our descriptions to determine what any other product with the same category name might contain or do for your skin. Our Boosters contain exclusive concentrations of a single, pivotal ingredient for skin. They include our C15 Super Booster,C25 Super Booster, 1% Retinol Booster, Hyaluronic Booster, 10% Niacinamide Booster, 10% Azelaic Acid Booster, and Peptide Booster. Along with a higher concentration of one superstar ingredient, each booster also contains an advanced combination of beneficial ingredients that support the main ingredient. Our Moisture Renewal Oil Booster features a proprietary blend of nine non-fragranced plant oils whose enriching properties quickly deliver skin-smoothing results that put an end to dry, flaky skin. Many of these exceptional ingredients are used in of our other products, but they offer heightened results when used in higher concentrations for more stubborn or frustrating skincare concerns. The evolving research leaves no doubt that these targeted ingredients can turn your skin around, solving many problems you may have thought you just had to accept or cover with makeup. Each booster was designed to be lightweight and layer or mix easily with your moisturizer and other products you use. The boosters can be applied alone, as a separate step, and can also be used around the eyes, with or without a separate eye-area product. Our serums are designed to work in synergy with your moisturizer by supplying an additional blend of potent antioxidants, skin-replenishing, and restorative ingredients. The special characteristic of our serums is their concentration of these critical, supportive ingredients skin of any age needs. Our serums also have distinctive textures appropriate for different skin types. We offer lightweight, fluid formulas for normal to oily or combination skin and more emollient, silky textures for normal to dry skin. All skin types can use our Retinol Serum. Can a booster or serum replace your nighttime moisturizer? Perhaps! Each type of product can work perfectly when worn under a moisturizer; however, for some people, especially those with oily to combination skin, a booster or serum can work fine all by themselves or when layered one over the other without a separate moisturizer step. Our boosters and serums contain the lightweight hydrating ingredients even those with oily or slightly dry skin need. Our Essence is an entirely different concept from our Boosters or Serums. RESIST Brightening Essence is a water-light product that contains multiple, potent, specialized ingredients to visibly improve dull, uneven skin tone, no matter your skin type. Ongoing use of Brightening Essence helps create a more even skin tone, revives radiance, and produces a luminous skin surface that looks younger. The research-proven ingredients we’ve chosen make this a fascinating option for those who want to tackle this difficult skincare problem. Brightening Essence can be used with any of our skin-lightening products for even greater results, or pair it with one of our vitamin C boosters once or twice per day. Our Boosters, Serums, and Essence are made to be versatile! They can be layered in any fashion once or twice per day, or used on alternate days, or you can apply one or more in the morning and different ones at night. There really is no single right way; everything is adaptable as you develop the method and frequency of application that you discover works best. The routine below is a step-by-step example of how you could add one or more of these products to your morning and evening skincare routines. Just be sure that your last skincare step each morning is your sunscreen.